I have a confession: I am a Cute Overload addict. A childhood love of Hello Kitty has never left me, and my "grown-up" home is adorned with quaint little tchotchkes (tastefully appointed). 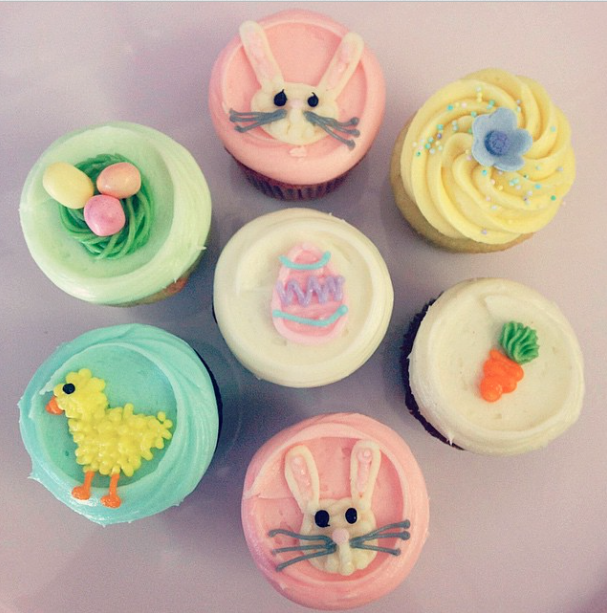 So it should not be surprising that Easter confections are among my favorite sweets—they celebrate cuteness! Adorable bunny-shaped chocolates, pastel-decorated cupcakes and cookies featuring baby animals look perfectly appropriate this time of year. To create these cupcakes, I used two classic recipes: a simple vanilla cake and Swiss meringue buttercream for the frosting. I made mini cupcakes for added cuteness factor, but larger cupcakes are probably easier to decorate. from "Good Enough to Eat"
3. Mix in the eggs, one by one; then add the vanilla. 4. Combine all the dry ingredients and sift. 5. Using a wooden spoon, alternatively stir in the dry ingredients and buttermilk. 6. Bake for 25 to 30 minutes for regular cupcakes or 20 minutes for mini cupcakes. 1. Combine the sugar and egg whites in a heatproof mixing bowl. 2. Over a pan of simmering water, whisk the eggs whites until they become frothy and pure white in color. The temperature should reach 160 degrees Fahrenheit. 3. Remove bowl from simmering water; continue to whisk until mixture is stiff and glossy. 4. Add the butter slowly by the tablespoon, then whisk in the vanilla extract. 5. Use immediately or refrigerate (for up to 3 days); use at room temperature. For the frosting, I used all-natural food colorings from India Tree, which are made from ingredients such as turmeric, annatto, beet juice and vegetable juice. These coloring are best for creating pastel colors rather than vivid primary colors. Also, since the colorings are water-based, you will need to make sure the frosting is well emulsified. Whisk vigorously until the frosting looks smooth and fluffy! The bunny noses and pupils were made from tempered (melted) dark chocolate. Once you've baked your cupcakes and made your frosting, prepare your mise en place for decorating. Create several piping bags out of parchment paper. Here's how: Cut triangles of parchment paper and then wrap them into cone shapes. Mix up your colors in the desired shades; you can make any color of the rainbow by combining red, yellow and blue. For design inspiration, I recommend searching for "clip art" on Google Images for simple shapes to copy. Have fun with it! A note about my cupcake decor: It was not exactly what I had in mind. The bunnies ended up looking slightly menacing (and the whiskers look a bit like mustaches because I didn't create a fine enough decorating tip), and my chicks' beaks aren't as sharp as I intended. It's because I had a few challenges with the buttercream frosting. Although it's the most delicious frosting, buttercream is not necessarily the best for decorating since it's so soft at room temperature. Keep the design simple for best results. Also, the base color of buttercream is yellowish because of the large amount of butter in the recipe. As much as I love Martha Stewart, her photo on the recipe page is misleading. It looks more like royal icing than buttercream. I used a "royal icing" (because it's whiter and smoother) for another batch of chick cupcakes. My cupcake decorating trials and tribulations have given me even more appreciation for my favorite cupcake shop, Sibby's Cupcakery in San Mateo. This boutique bakery makes the best custom cupcakes anywhere with the most wonderful decorations, always super cute and original! Sibby's enticing pastel frostings and adorable designs will be my inspiration for my next batch of cupcakes! Yes! I wanted to plan a fun activity to do with my niece, you make this look so fun and easy so I will try it next time I see her!! Please let me know how your cupcake-making activity goes! I'd love to see photos!